The Law A level includes two major components – AS level and A2 (2nd Year) level. The AS level is a qualification in its own right and may be studied with OOL as a one-year distance learning course. The course includes ten Tutor-marked Assignments (known as TMAs), six in the AS course and four in the A2. 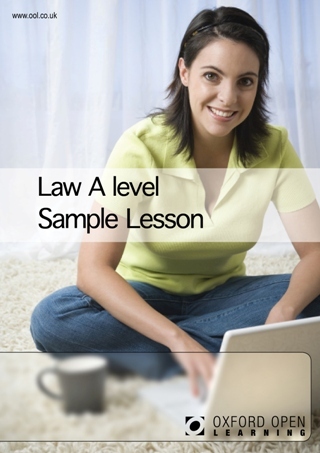 The Law A level includes two major components – AS level and 2nd Year (A2) level. The AS level is a qualification in its own right and may be studied for on a one-year distance learning course but AS results no longer contribute towards the full A level result. The course includes ten Tutor-marked Assignments (known as TMAs), six in the AS course and four in the 2nd Year. This course prepares candidates for the AQA Law A level syllabus 2160 for examination in 2018 (only) and the AQA 7162 specification in 2019 and later years. Some candidates will take the AS 7161 examinations although AS results no longer count towards the full A level. But all the AS content is relevant to the full A level examinations. We have chosen this syllabus as it is the most suited to distance learning. In 2018, A level assessment is by four written papers, two at AS and two at A2. There is no coursework. From 2019, with the new AQA 7162 specification, there are just three equally-weighted written examination papers, each lasting 2 hours, with 100 marks available. The three papers cover criminal law, tort and contract law within the context of the English legal system. At AS level, there are two examination papers (90 mins, 80 marks each). Paper 1 focuses on criminal law and Paper 2 on tort but not to the same depth as in the full A level. Students wishing to study the A level Law course need a minimum of 4 GCSEs or equivalent. This should include good grades in English GCSE or English IGCSE. Students need not have studied Law GCSE. This course has been designed to give you a full and thorough preparation for the AS level 7161 and/or A-level 7162 set by the Assessment and Qualifications Alliance (AQA). Students will be able to take the AS exam for the first time in June 2018. Marks from the AS can no longer be carried over to the full A level. In all the above exams, questions are a combination of multiple choice, short answer and extended writing questions. These should include good grades in English GCSE or English IGCSE. Students do not need to have studied Law GCSE in order to start the A level.